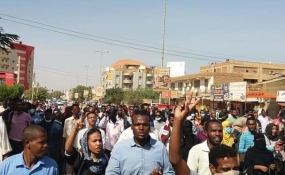 In a statement on Monday, the officers called on the Sudanese police not to implement the wishes of Al Bashir, which they described as "despicable by killing people to remain in power while he and his family enjoy the fruits of the country". The statement said that the killing of protesters as punishment is "a flagrant violation of the purposes of the Koran". The place of punishment "this ignorant Al Bashir" talked about is in the courtroom and "you are not judges to rule as it is imperative for your profession to protect the lives of people, not execute them". National police officers confirmed that the police record is still clean, clear, and honourable with the honourable testimony of the people of Sudan. "Any slide into blind violence and shedding blood as the killer Al Bashir wants will undermine the credit of this great profession and will shame and the lives of martyrs". The statement added: "So let Al Bashir, his brothers, and the fat cats go out to face the people whom you humiliated, impoverished and despised, rather than you who whose salaries are not enough for one week."